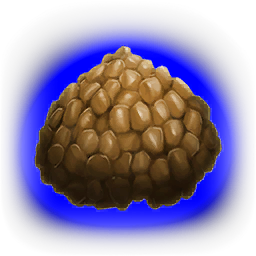 Kibble are food items used to tame creatures more quickly and with higher affinity, allowing players to save time and end up with better stats on their tamed pet. The Kibble system was reworked with the ARK: Homestead update and is currently available on every platform excluding the Mobile and Nintendo Switch versions. Instead of Kibbles based on eggs, the Kibbles are replaced by quality-based types: Basic, Simple, Regular, Superior, Exceptional, and Extraordinary. The egg-based Kibbles are still in the game and are able to be used; however, they are no longer craftable. Additionally they are categorized into one of the 6 quality-based types. 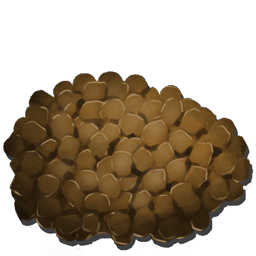 All Eggs (excluding Araneo Egg and Moth Egg) now have a size and can be used to create a corresponding quality-based Kibble. In the Mobile and Nintendo Switch versions, most Creatures have a preferred egg-based Kibble that tames the Creature with the greatest taming efficiency and effectiveness. However, using a Kibble that is not preferred by the Creature is even worse than taming with Raw Meat or Berries. Kibble can be used as food when taming a creature. Although all Kibble types will technically work to tame all creatures, certain kibbles will work better for certain creatures. Using the wrong kibble will take longer in the best case, but can also be only 2/3 as effective as using the creature's regular food and will instead decrease the taming effectiveness. Creatures prefer at least one specific class of kibble, but accept also kibbles of a higher class, e.g. Argentavis can most effectively be tamed with Superior Kibble and better, but Basic, Simple, and Regular class have worse results than meat. The food value of a Kibble depends on the Creature and the type of food. For Kibble it varies between 20 and 135. Non-favorite kibbles gives only 1/8 of the taming progress than the favorite kibbles. Kibble is also used for imprinting baby dinos. During care, they may want to be hand fed a randomly selected kibble, including any kibble that is not their species' preferred food. 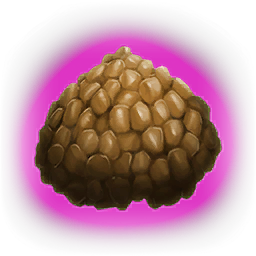 For this reason, having as many types of kibble as possible will allow the imprinting rate to increase. Learning an Engram is not necessary to create kibbles, and there are no Engrams available for them anyways, just recipes are found throughout the world. Follow the same instructions as when cooking with a Cooking Pot or Industrial Cooker. In addition to the ingredients listed below, all kibble recipes require 5 × Fiber and a Waterskin with at least 25% water in it (any other Water-container works, but will be completely used up regardless of capacity). When creating Kibbles in an Industrial Cooker which is hooked up to a water irrigation system, no waterskin or other water-container is necessary. Fertilized eggs can also be used to make Kibble. Breeding creatures is a great way to generate eggs on-demand. Cooking these kibbles requires a lit Cooking Pot so in addition you need fuel for the fire. It takes 30 seconds to cook 1 kibble in a Cooking Pot. 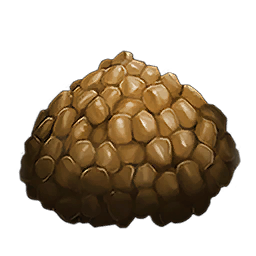 Although these Kibbles are no longer craftable for PC and Console, they are still craftable in ARK: Survival Evolved Mobile. The following Kibbles are used to tame the dinos listed below them. Kibble can be used as regular food for tamed dinos. Kibble takes 3 days to spoil, which makes it last longer than most other food types. It also stacks to 100 and weighs little compared to other foods. Kibble can last for very long periods of time when stacked and preserved in a Preserving Bin or Refrigerator (Refrigerator is recommended as the spoilage time is greatly increased). The amount of food per kibble depends on the type of kibble and whether the kibble is preferred by a particular dino. Most dinos gain 80 food from their preferred kibble, even if other dinos would gain more. There are exceptions; for instance, Daeodons gain 120 food from their preferred kibble (Iguanadon/Superior), which normally only gives 90. Aside from being preferred by a dino, kibbles will give either 60 or 90 food per kibble. Kibbles that give 90 food generally require Prime Meat Jerky and as of v257 are: Ankylo, Araneo, Archaeopteryx, Argentavis, Ichthyornis, Iguanodon, Kaprosuchus, Mantis, Megalosaurus, Microraptor, Moth, Oviraptor, Pulminoscorpius, Quetzal, Rex, Spino, Stego, and Tapejara. All other kibbles give 60 food, unless preferred, of course. Due to these traits, using Kibble as regular food can be useful on some occasions. Like when leaving your creatures behind for long periods of time, as you have to fill the creatures' inventories less often. However, farming Eggs is still very time consuming and expensive, so generally it is not recommended to use as regular Dino food. When using Kibble for this purpose, it is advised to use Kibble types that are easy to make, like the Dodo Kibble. 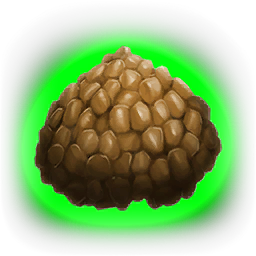 The Super Kibble is a type of Kibble exclusive to ARK: Survival Evolved Mobile. It can be crafted in a Cooking Pot or in an Industrial Cooker by substituting the normal Egg with a Super Fertilized Egg. A Super Kibble will tame a wild creature faster than a normal Kibble with greater Taming effectiveness. This page was last edited on 5 April 2019, at 19:49.